Event: Potomac NAVDHA Natural Ability event. The Potomac Chapter of NAVDHA holds a Natural Ability test for a dozen or so dogs at the McKee-Beshers preserve in Maryland. 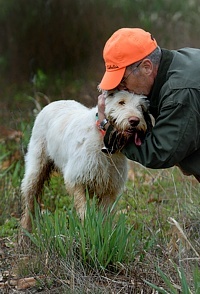 Molly the Spinone works along a strip of cover during her bird-finding test. She's come to a stop along the edge of the sorghum, and stays on point as her handler comes in to flush the bird. 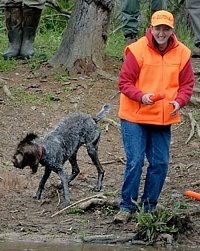 Molly's handler and a judge walk behind her as she hunts up the next of the five birds that have been put down in the field. She's just started getting birdy again, so the judges come to a stop, giving her room to work. Looping back from the treeline after a chukar flush. A chukar is up and around, and Molly has just eyeballed it on her way by. She's fast, but so is the bird. Partridges will often give running a try before they'll take to the wing.
. . . but the bird has hopped into some cover, and now that it's invisible, Molly becomes more thoughtful about it. Standing another bird. The judges have seen her willingness to go for the flushed bird, so they'll step right in and bag the bird if they can. Running right on past the bird bag. She knows the difference between one in the hand, and a more interesting one in the bush. The judge is watching farther down the course, while Molly eyes the cover, and her handler watches her body language . . .
. . . before they head down the sorghum patch to the end of the first field. With a cut through the trees into the next field, and a turn into the wind, the pace picks up. Since she's already shown eagerness for the flushed birds, the judges are content to have her handler collar her after a new find. Working down a row of teasles. A bit of boredom (and remarkable patience) between tests. A bite of food before heading into the tracking event. Some planning, while looking at the cover and the wind, before the first dog's tracking test. An unsual spectator buzzes the test grounds. The US Park Police are all too often called upon to work the Potomac River's deceptive waters. 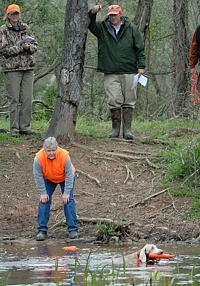 While the handler keeps his dog in a blind, the judges release a pheasant to run into the cover. The handler leads the ready-to-go Weim over to the pile of feathers being pointed out by the judge. That's the start of the trail the dog needs to track. And off he goes, tracking those pheasant feet. Returning, right quick, with that pheasant. But that grip is just a little awkward . . .
. . . and minus a tail feather, the rooster is back on the move. Whew! 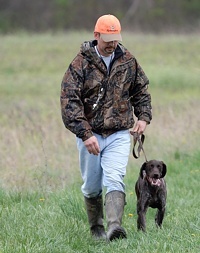 The handler's done with that run, but his Weimaraner would just as soon do it all over again. The next handler and her dog are waiting at the blind while the bird planters set up the next track. Most pointing dogs are very good at visually marking game on the ground. The blind prevents them from seeing these releases. Nose down, it's off to track that bird. Though, giving up that bird isn't as fun as tracking it down. The judges compare notes as the handler keeps the dog's idea of a test prize at arm's length. Another team trails the bird man out to the tracking course. The pheasant has left a track towards the woodline, and one judge is scattering some more feathers to mark the starting point for the dog. Spectators watching the tracking event need to stay out of the way. 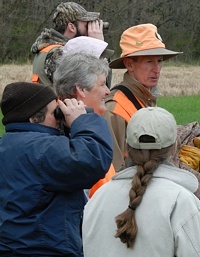 Binoculars are a popular accessory. Marching back out after a quick and succesful track. 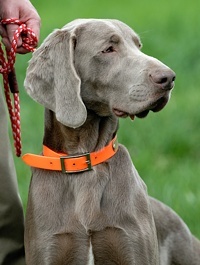 A Weim waits his turn, and watches from the sidelines. A cool customer. Moving the blind. Each new track needs to start upwind, and far enough away from the previous track to give each dog something specific with which to work. Molly the Spinone waits behind the relocated blind while the new track is established. At the water test, a bumper is thrown into water just deep enough to require a swim. 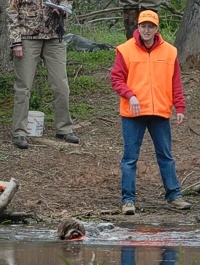 The judge are looking for the dog's willingness to get into the water. The retrieve isn't strictly necessary, but most young dogs will eagerly go after that dummy. And there's usually two or three tosses, so that the judges can get a good sense of the dog's disposition around the water. Every dog we watched was ready to go acquire that bumper . . .
. . . though some young dogs can't resist taking it for a more scenic swim before bringing it back in. This intent Griffon, paw up in on-point style, is waiting for something to hit the water, and for a command to go after it. 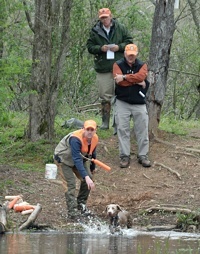 Owners of shaggier dogs - Wirehairs, Spinoni, Griffons, Setters - are happier with the spring-season water. Later in the season, it can get a lot smellier. Shaking off swamp water, alas, does not shake off the Eau de Swamp.